This paper deals addresses the current state of High-Speed Railway with respect to signalling and train control technology and how digitization will play a significant role. The analysis includes proposal in the medium term for improvements from current situation. Different aspects of the current High-Speed Railway are described, including their success factors, the requirements of the railway operators and the technology currently used. 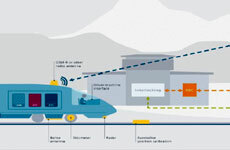 It also describes the current portfolio of products offered by Siemens for the signalling of High-Speed Railways. Finally this paper describes a potential future for High-Speed Railway and how digitalization will play a key factor in its transformation. As an example of the systems that benefit from digitalization, ETCS Level 3 system is briefly described.